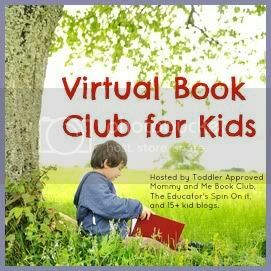 January Virtual Book Club for Kids is coming January 21st! 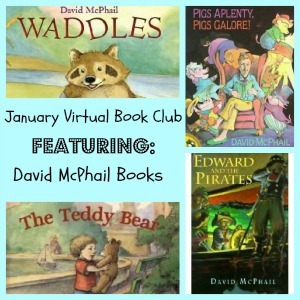 This month a group of bloggers are joining together to enjoy the books of David McPhail. McPhail is a very prolific writer for the preschool-early reader crowd. If your kids are interested in anything pig to pirates to teddy bears and fat raccoons, McPhail will be a fun author for you to explore. I shared one of his books last spring, The Puddle. I haven't picked our Virtual Book Club pick yet, so if you have a favorite book by David McPhail-- share it in the comments. We might pick it! 1. Comment below and let me know you'll be joining us for the book club this month. 2. Choose a book by David McPhail and read it to your class or family. 3. Create a book activity to go with the book (craft, activity, cooking project, etc) 4. Come back and link it up on January 21st. The linky will be live for 3 weeks so feel free to add more than one project or link up later. What an awesome idea! I'd love for you to share this at my Winter Bucket List link-up (open all of January). My boys are just two, but I'll have to check out this author and see if I can find a book that inspires a twin-two-year-old-friendly activity. We look forward to joining your for this months virtual book club. We can hardly wait. Off we go to look for a David McPhail book in our local library. Looking forward to participating in the virtual book club! I am a homeschhol Mon and my homeschool group.is planning on doing a book club for all ages. I am going to work with the preschoolers. I would love to join in the vbs.